Charity Golf Day held at Gardens Park Golf Links. Make sure you join in on this fun day and help raise money for kids in need around Australia! 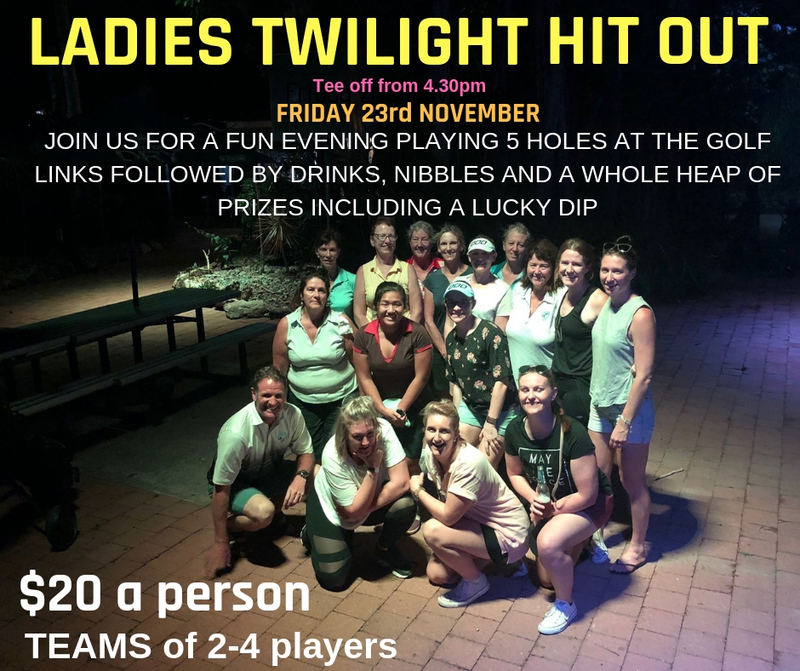 To book your team please email functions@gardensparkgolflinks.com.au, phone our pro shop on 08 8981 6365 or through Gary Prunty. Registrations are open - email functions@gardensparkgolflinks.com.au or phone 08 8981 6365 to book your team! All ladies are welcome to join us for a fun evening. You must register by emailing functions@gardensparkgolflinks.com.au or phone the pro shop on 08 8981 6365. Grab a friend and join the fun for our Christmas Ambrose Competition. There will be lots of prizes to be won including delicious Christmas hams! You can tee off any time on the day. Enjoy the pizza buffet afterwards which will be served around 6pm. Join us for a fun evening playing 5 holes at Gardens Park Golf Links for only $20 per person. Followed by drinks, nibbles and a heap of prizes including a lucky dip! Ladies, Golf NT are hosting a Sip and Swing afternoon on Thursday 18th October from 5:30pm - 7:00pm at Gardens Park Golf Links. 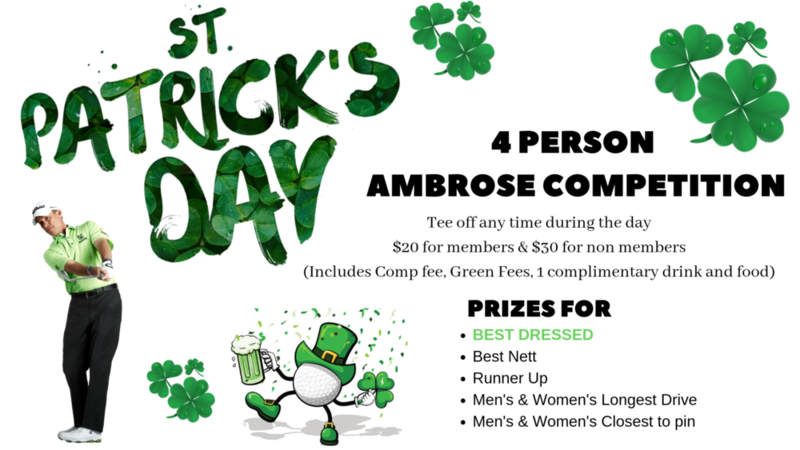 For only $10 per person, receive a complimentary glass of champagne and golfing tips from PGA Professional, Nathan Campfield. Four golfers from the Northern Territory will win the chance to play nine holes at The Lakes Golf Club on Day 3 of the 2018 Australian Open, and you could be one of them. All you need to do is play in at least one official nine-hole competition between 1 September and 21 October 2018. You will need an official Golf Australia handicap, because the four winners will be the best two male stableford scores and the best two female stableford scores from around the NT. The winners will fly to Sydney on Friday 16 November 2018, stay for two nights, receive a gift pack and can attend the Champion’s Cocktail Function – all courtesy of Golf Australia. As a further incentive, Golf Australia has announced that, in 2019, two Australian golfers will fly to Northern Ireland to compete in the R&A's nine-hole championship final at Royal Portrush – the venue for the 148th Open – the day before championship week begins. The experience of playing nine holes at Royal Portrush, a venue to which the championship returns for the first time in 68 years, just before the world’s best get into their work, will go to the best individual male and female stableford scores at the second playing of Golf Australia’s national Play 9 final. This event will take place on the Saturday of the 2018 Australian Open at The Lakes Golf Club in Sydney, with the qualifiers from each State and Territory eligible for the prize! State of Origin Game 1, LIVE on the screens in our Beer Garden at Gardens Park Golf Links. What better way to watch Game 1 then in our Beer Garden in this beautiful dry season weather? Hot food, ice cold drinks, 3 big screens & plenty of seating! $200,000 HOLE IN ONE SHOOT OUT COMPETITION! The Hole in One Shoot Out Competition is back! Prizes to be won each week, including Gardens Park Golf Links Memberships, with the big prize of $200,000 up for grabs for those who qualify. Every Friday night from 25th May to 13th July 2018, from 6pm - 9:30pm. Hot food, ice cold drinks, plenty of seating! Bass in the Grass Pre-Party Function happening at Gardens Park Golf Links this Saturday 19th May and everyone is welcome! We are located across the road, just a 2 minute walk to the festival and what better way to start your day then in our beautiful Beer Garden in this dry season weather. Food, drinks (including beer and cider on tap), music, driving range, mini golf and there is plenty of seating. Scott Murphy will be performing LIVE for a Gardens Park Sunday Sesh! Drink Specials & Hot Food Available! !